Medical school is hard. I'm constantly amazed at the sheer volume of information being taught in each class. It's made more difficult by professors with thick Israeli accents, trying to juggle ten subjects at once, and also learning a new language. Reading my previous posts, I think I've given an unfair picture of what my life really looks like. I'm not constantly off on a new adventure, seeing the sights and having fun. I wish this were true. Too often, I'm sitting at home, alone, reading a textbook. Or having study sessions with classmates. Despite how difficult things can be, I wouldn't want to be anywhere else. Even when the sirens go off at 5:30am, telling me I have sixty seconds to get to the miklat (shelter) before the rockets hit (don't worry Mom and Dad, they usually hit open areas). All of my classes are interesting, my classmates are amazing, and I'm learning to love the dusty desert town I call home. Even so, it's always nice to escape real life for awhile. This past weekend, the Christian student group arranged a retreat in Tiberias. We studied the words of Jesus on the shores of the sea of Galilee, climbed down a mountain, and visited some hot springs. It was a welcome relief from the stress of school and a great way to get to know some new people. careful! use the hand holds! After such a grueling, but incredible day, we decided we needed something relaxing the next day. So we headed to a nearby hot springs that was turned into a spa. So, yes, medical school is difficult. 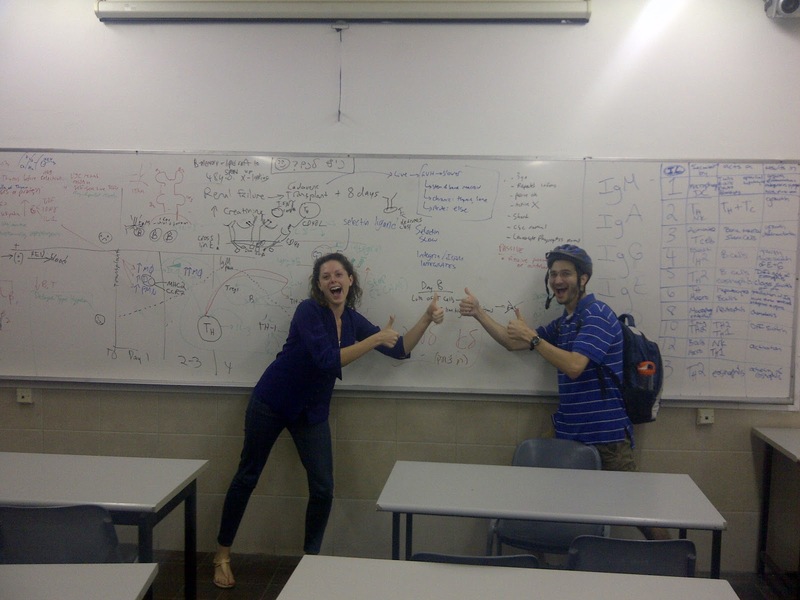 Most days are spent going to class, reading, studying, and deciphering Hebrew. There is a never-ending list of things to understand, memorize, and take to heart. But it's the rare times away from all that when I realize how lucky I am to be living the life I lead.